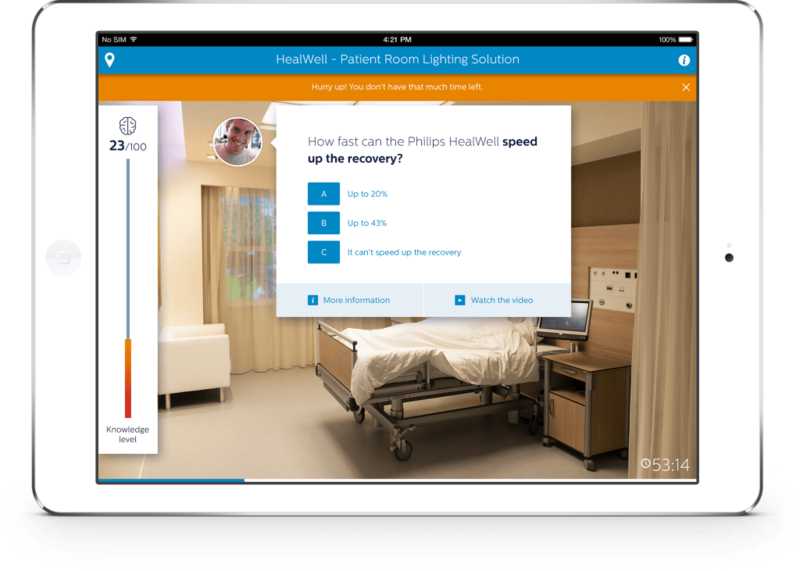 At the Philips Customer Visit Center you can experience a wide variety of innovative solutions and products that are developed by Philips Healthcare. Partout d.n.a. was asked to create an innovative way of guiding their visitors around. We won the pitch and as a result, we created an educational serious game combined with storytelling. The main target group of the CVC is students. They usually go on a school trip to the CVC and there they are guided by an ordinary guide. We decided to turn things around. The students are going to be the guide (Philips experts), and they are going to guide a group of trainees. We gave the students the responsibility to provide the trainees the correct information. To spice things up a bit, they need to complete their tour in an hour. Time is of the essence! Because they only have an hour, we needed to make the configuration simple and intuitive. In just two steps, the group (approx. 5 students per group) can enter their name, gender and field of expertise (education). Based on the choice of education – medical, technical or other – different questions will appear during the game. 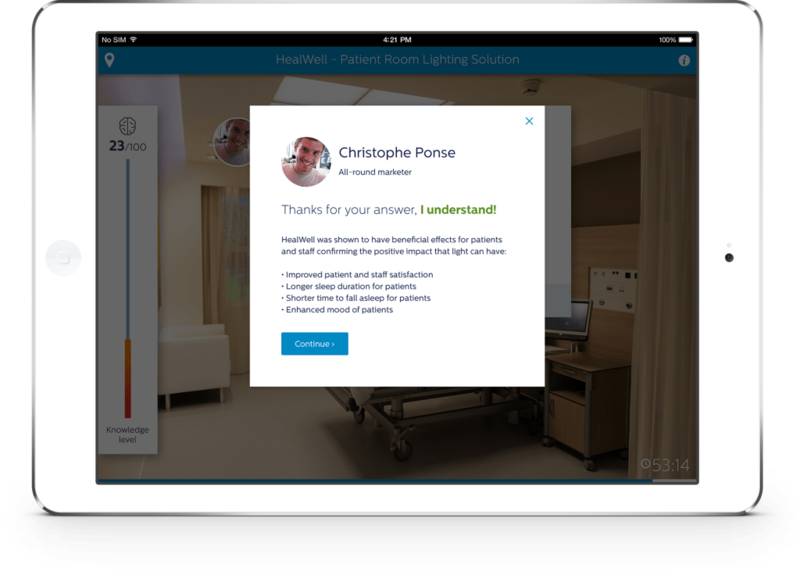 As a Philips ‘expert’, it’s the job of the user to guide their group of trainees around the Customer Visit Center. 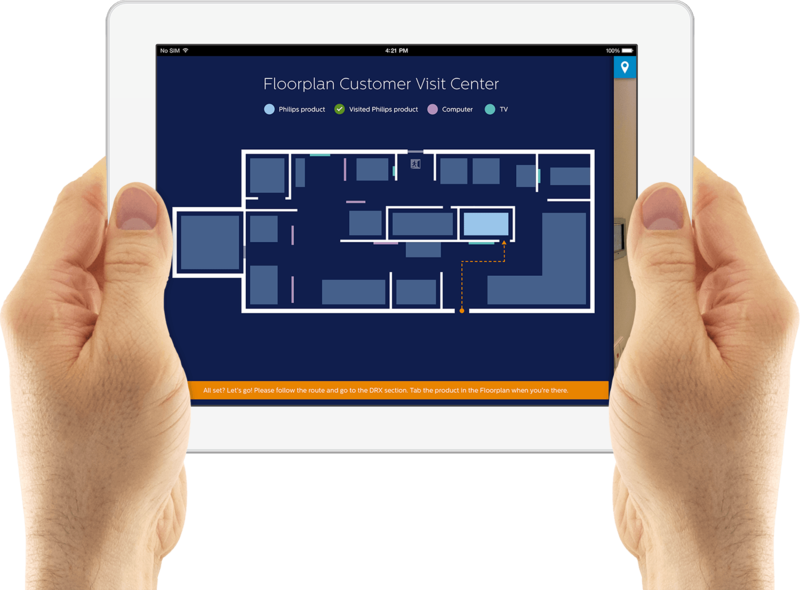 By using the floorplan the users know exactly where they are and where they need to go. During the tour, the user will get questions from their group of trainees. The user needs to answer these multiple choice questions. They can use available ‘helplines’ (video and text content). The funny thing is that the user is expanding his own knowledge level by answering these questions: which is the ultimate goal of the Customer Visit Center. When the tour is done the group of experts (the users) will get a short message from the CEO of Philips to thank them for there help by guiding the tour. In a clear overview the total knowledge level and total time is displayed. 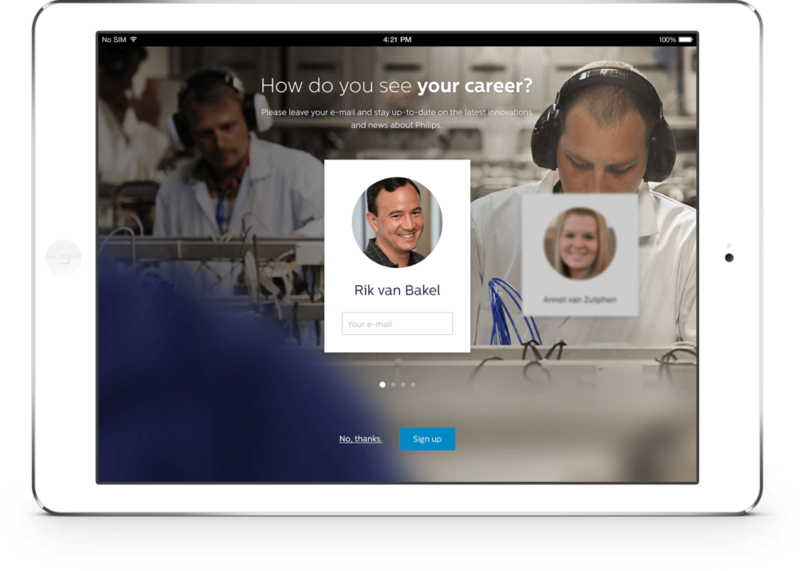 At the final screen, we ask the users to fill in their e-mail so they can stay up-to-date on the latest innovations and career opportunities at Philips. We use the data they previously filled in during the configuration to maximize conversion.